I sent an email to Riverside County Supervisor Bob Buster‘s office last week inquiring about the funding for “A” Street (Fairway Drive). I received a reply the next day from a member of the Supervisor’s staff, which included an update that seems to be positive news for anyone who wants the street to be built. Most recently the City has approved that the County can take the lead in acquisitions of the Right-of-Way. This can be a lengthy process and the county is already pushing forward on the acquisitions. Therefore, a specific time line has not been established for the road project but our goal is to begin the building of the road within the next 12 months. For more background, read the following summary from the March 15, 2012 TLMA Submittal to the Riverside County Board of Supervisors. I will continue to post updates about “A” Street as I learn of them. BACKGROUND: The “A” Street project is a proposed two lane collector road connecting McAllister Parkway to Van Buren Boulevard, of which 40 percent is located within the jurisdictional boundaries of the COUNTY and 60 percent is located within the jurisdictional boundaries of the CITY. In 2006 the COUNTY approved Tract 30153 (McAllister Hills), which would have constructed a golf course residential community development. 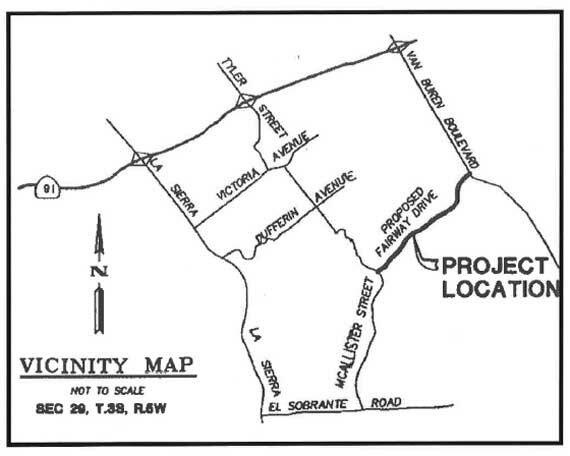 The COUNTY required this tract to construct a new road between McAllister and Van Buren, referred to as “A” Street, which would serve traffic from the development and provide an alternate access route for residents of Victoria Grove, The Orchards, and other communities in the area north of Cajalco and east of La Sierra. On December 18, 2007, the Board of Supervisors approved item 3.58 which consented to and authorized the CITY to act as lead agency on behalf of the COUNTY for purposes of land acquisition services and eminent domain necessary for “A” Street, since most of the property to be acquired was within CITY limits. The road design was nearly complete and right-of-way acquisition was about to commence in 2008 when work ceased on the developer’s project, which went into foreclosure due to the economic downturn. Since that time, the community desires to see “A” Street move forward ahead of development due to the closure of the extension of McAllister north into the City of Riverside, which was done by the CITY in 2009. The CITY and COUNTY are working together to identify potential funding for this project. On November 30, 2010, the Board of Supervisors approved item 3.63, Engineering Services Agreement by and between Hunsaker and Associates and the COUNTY. The engineering firm did the original road design for the Developer. The firm is in the process of reviewing and revising the original design, including additional geotechnical engineering work to see what can be done to reduce construction and right-of-way costs via a reduced roadway section and engineered slopes. The Agreement between the COUNTY and the CITY provides the terms and conditions under which said Project is to be pursued. The Agreements further defines project-related activities, including real property activities, to be performed by the CITY and the COUNTY. The Agreement will also formally revoke the COUNTY’s consent to authorize the CITY to act as lead agency on behalf of the COUNTY for purposes of land acquisition services and eminent domain necessary for said Project, and designates the County as lead agency. If you would like to read more about “A” Street and the Dufferin Avenue closure, click here.